With the printers of the iMZ series from Zebra you surpass all boundaries the mobile printers iMZ220 and iMZ320 are neither bound to one location nor an operating system. 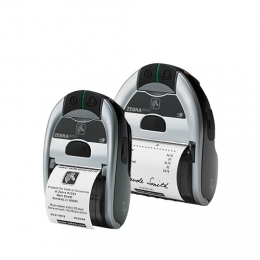 Depending on the model, you print receipts and slips with a width of 48 mm and 74 mm, independent of the platform. The printers connect easily via Bluetooth Wi-Fi with dual band support optional. Max. print speed 102 mm/sec. Thanks to Print Touch, connection to Apple devices such as an iPhone or iPad, Windows or Android hardware occurs fast and is no problem. Zebras customary high print quality and a print speed of 102 mm/sec. await users. As part of a mobile POS solution in retail and hospitality, as a receipt printer for field service staff or as a mobile ticketing office - the iMZ models are up to the challenge. Pinpoint sharp printouts with up to 203 dpi 8 dots/mm always ensure for impressive results. The media tray opens with a single push of a button, so that on-site media changes are easily realised.